The clock tower you see here today was actually a later 19th century addition. The main historical relevance of this places is as the historical primary entrance gate to the Old Town. Inside the entrance walls used to be an armory and and a chapel. Note the Tuscan style portico. The square surrounding the tower has lots of shops and is a great place for people watching. Right under the clocktower entrance you’ll find a bunch of vendors selling souvenirs and miscellaneous items. There’s not much else to do here so take your pictures and head into the city! Pretty good. Great tourist attraction, lots of people. Best time to photograph would be at night. Probably my favorite place inside the walled city of Cartagena. There are many beautiful shops, bars and restaurants around this area. But what really takes the price it's the very talented performers dancing to classic Colombian salsa and other genres. Not really much to see. It's a small clock tower with tons of tourists and a selection of tons of sweets vendors, tons of cops, tons of touts, or tons of ladies of the night. It's an excellent landmark for taxis and meetups. It's a historical spot but not super exciting or super historical. It is an entrance to an old town located inside the ancient fort. From here an independence has started with shooted from the cannons ships. Another one method that had been used is a wall inside the sea. 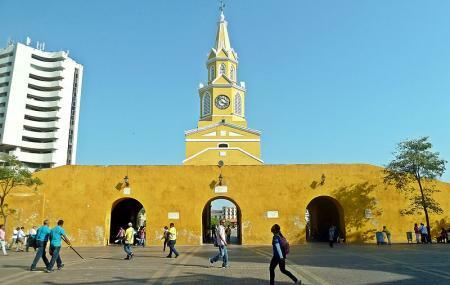 Nowadays Colombia has a celebration of this named "day of Cartagena independence". Quiet place with restaurants and museums. The level of everything is "Colombian", but good enough. Keep your bags and expensive cameras inside. This is an amazing place, however the vendors that walk up to you, dont stop pushing trying to sell you their stuff, even after you say No Gracias. Would be nice if local officials helped control this.